Biometric authentication mechanisms are becoming increasingly popular, and it’s easy to see why. They’re faster than typing a password, easier than carrying around a separate security key, and they prevent one of the most common pitfalls of knowledge-factor based authentication—the risk of shoulder surfing. In the case of biometrics, FAR measures how often a biometric model accidentally classifies an incorrect input as belonging to the target user—that is, how often another user is falsely recognized as the legitimate device owner. Similarly, FRR measures how often a biometric model accidentally classifies the user’s biometric as incorrect—that is, how often a legitimate device owner has to retry their authentication. The first is a security concern, while the second is problematic for usability. In Android 8.1, we introduced two new metrics that more explicitly account for an attacker in the threat model: Spoof Accept Rate (SAR) and Imposter Accept Rate (IAR). As their names suggest, these metrics measure how easily an attacker can bypass a biometric authentication scheme. Spoofing refers to the use of a known-good recording (e.g. replaying a voice recording or using a face or fingerprint picture), while impostor acceptance means a successful mimicking of another user’s biometric (e.g. trying to sound or look like a target user). can’t authenticate payments or participate in other transactions that involve a KeyStore auth-bound key. 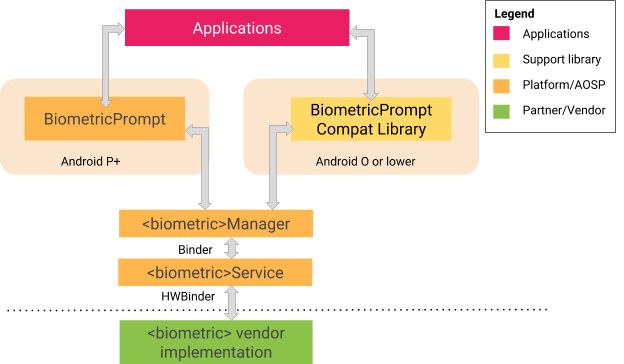 Here’s a high-level architecture of BiometricPrompt. We want Android to get it right across all three. So we’re combining secure design principles, a more attacker-aware measurement methodology, and a common, easy to use biometrics API that allows developers to integrate authentication in a simple, consistent, and safe manner.